This is a high quality shaker comes with 2 extra compartments which could be used for keeping extra powder or capsules as required. This shaker could also be used with only one compartment if someone is not looking for two extra compartments. This shaker bottle is 100% leak proof which helps you to drink the shake rather than spill it all over the clothes. The cap wire is made from surgical grade stainless steel which helps to bring the better smooth shake every time. Bottle contains added millilitre markings to help you guide in adding the right amount of water for the perfect shake. 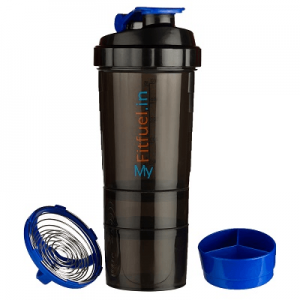 High quality and beautiful design makes this bottle a good choice for the gym individuals or the players for consuming their protein or other shakes before, during or after exercise. i take it where ever i go. i fill protein in one compartment alwyas.